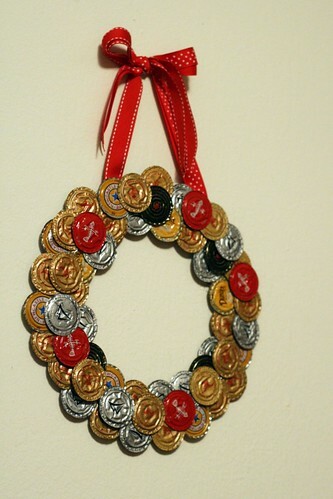 I can’t remember when I first saw and favorited this photo of a bottle cap wreath, posted by Elise Blaha. But ever since I saw it I’ve been wanting to try it. This past year has been a bit more of a crafting year than previous ones, so sometime around Thanksgiving, I sent out a bulletin to my family to start saving bottle caps. And then I embraced yet another excuse to buy ribbon at the craft store. I knew my dad would know the best tricks to flattening the bottle caps, but I didn’t really envision it being a task that required as much nitpicky work as it did. I’d collected the 50 or so bottle caps I needed, and hammered them all on Tuesday night in the chilly garage at my parents’ house. Dad referred to it then as a labor of love, and boy howdy was he right. My thumb is still feeling a little funny a day later. But dudes! Look how cool it turned out! 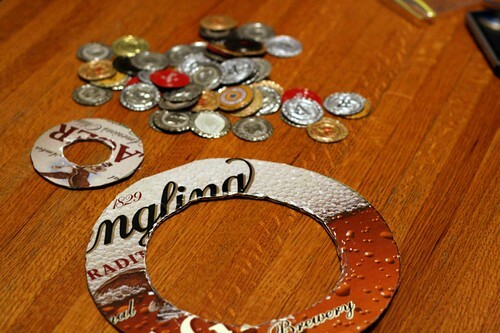 I cut a wreath shape out of an empty case of beer, using a bowl and a smaller bowl as the models. I also cut a smaller circle to test out, because I wasn’t positive that the hot glue would stick the bottle caps to each other and to the cardboard. 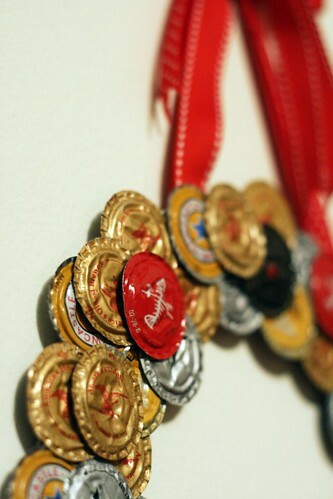 It took a lot of willpower – A LOT OF IT – to arrange the bottlecaps haphazardly, as opposed to in an orderly and color-coordinated fashion. I really wanted to count them out when I sorted them into colored piles so I could evenly distribute them. But I didn’t. I swear. 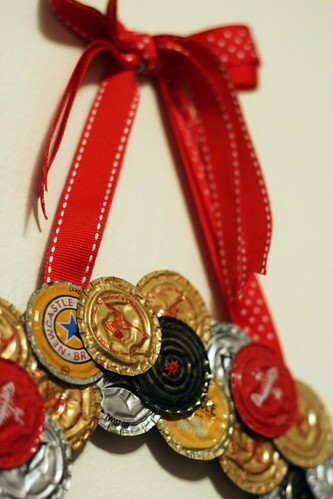 To adhere the ribbon, I cut two holes in the wreath template and threaded the ribbon through before gluing on the bottlecaps. I felt like that would keep it more sturdy in the longterm. We’ll see. Either way, I’m psyched to report that this craft was totally worth the effort. Now if only I could decide whether to ever make one of these again, knowing that my sister’s boyfriend and his family apparently have a gigantic jug of bottle caps they’ve been saving. For me. This entry was posted in crafts, photography. Bookmark the permalink. Whoa, it looks so awesome! And you should totally use those ones that are saved for you because it means an excuse to buy a different colored ribbon!